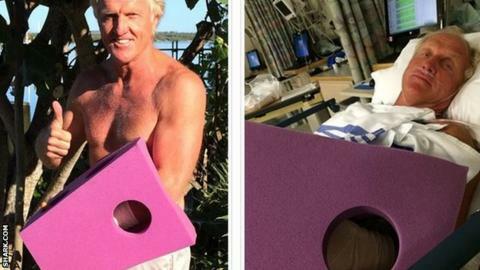 Golfer Greg Norman is expected "to make a full recovery" after he nearly lost his left hand in a chainsaw accident. The 59-year-old Australian, who won the Open in 1986 and 1993, injured himself trying to cut some tree branches and tweeted pictures from hospital. He has since had surgery on his arm to repair "some minor nerve damage". "The doctors expect him to have a full, speedy recovery and to be playing golf and attacking life shortly," read a statement on Norman's website. "Norman was spending the afternoon cleaning up some trees in his backyard on Jupiter Island, Florida when a large branch unexpectedly started to come down on him. "Attempting to catch the branch, Norman dropped the chainsaw. The weight of the branch brought Norman's arm down upon the saw that was thankfully slowing." After the accident, Norman tweeted: "I was one lucky man today. Damaged but not down and out. Still have left hand." He said the chainsaw "missed his artery by a fraction of an inch" but has now returned home to rest and recover. Norman, nicknamed The Great White Shark because of his distinctive blond hair and aggressive style of play, led the world rankings for 331 weeks in the 1980s and 1990s.